Powers/Abilities: Although endowed with savage and unpredictable hand-to-hand combat abilities, the Red Skull did not possess superhuman powers. His best weapons were deception, acting, mimicking, suprise and his evil genius. Added to his cruelty and swiftness of action he utilized some advanced weapons, some of them well hidden in his suit. His abilities made him extremely dangerous. Among the many tricks he used were the "Look of Death" a false hypnotizing killer gaze, actually a poison injected through a hypodermic needle, and the "Touch of Death", actually a lethal electric jolt emitted from his gloves, which killed by contact. History: (Captain America Comics#1/3 (fb) - BTS) - The Second World War had started only some months before when George Maxon, president of Maxon Aircraft Inc., accepted a secret proposal from Germany's Führer Adolf Hitler. When America would be submitted to the Third Reich, Maxon would become Minister of the USA Industry. Maxon's work as a spy became more active and dangerous. (Captain America I#255 (fb) - BTS) - Maxon donned a red frightening mask, taking the name of the Red Skull. The original Red Skull was a German-born terrorist trained by Hitler in person, already active before the creation of Captain America. (Captain America Comics#1/3 (fb) - BTS) - In this new identity Maxon gathered criminals and Nazi sympathizers, creating an underground organization and started several activities including robbery, espionage, sabotage and murder. He wanted to spread terror and uncertainty in the American people in order to weaken the country before the arrival of the Nazi forces. (Captain America Comics#1/3) - The Red Skull sent a message to Major Croy, announcing his death by his hands. Shortly after, by night, the Red Skull sneaked into Croy's house through a window and strangled the Major. He used his Look of Death, leaving Croy's face paralyzed in a stare of horror of something unholy. He crouched outside the window to be sure that the body was discovered and that the effect of his Look of Death was efficient enough. When Steve Rogers, James Barnes and the police arrived, the Red Skull left. That same night, the Red Skull met his henchmen at his headquarter, planning a robbery of the First National Bank. During the meeting, Bucky discovered the place but was captured by Slug, one of the gangsters. Shortly after Captain America also discovered the hideout, surprising the criminals and freeing Bucky. In the resulting fray, the Red Skull escaped through a hidden exit, but his henchmen were captured. The next day George Maxon went to Camp Lehigh to attend the test of a new model of airplane produced in his factories. General Manor, one of America's greatest militaristic geniuses was with Maxon and together they watched while the sabotaged plane was destroyed. In the meantime the Red Skull had a package sent to the Manor's house. The package contained a red skull and a message of death. That evening, when the General returned home, the Red Skull assaulted him. The General managed to fire a shot that missed, and the Red Skull killed him. General Manor's wife arrived with a gun in her hand and found the Red Skull gloating over her husband's dead body. Worried for her husband, she dropped the gun, letting the Skull beat her, which distracted him long enough for Captain America to arrive on the scene. In the resulting fight the Red Skull even managed to knock the Super Soldier out, but the unexpected attack of Bucky saved the hero. This time the final blow was given by Captain America. The blow knocked down the Skull and shattered his red mask. The heroes recognized Maxon and Bucky also found the hypodermic needle that the Red Skull was using on Captain America. Maxon jumped to grab it, and in the following struggle with Bucky, he got injected with his own poison and apparently died. Shortly later, FBI agents examined the Red Skull's body, and found the evidence that he was working for Hitler. (Captain America Comics#3/1) - Maxon actually was immune to the deadly effects of his "Look of Death" poison and escaped, vowing revenge and keep up his dirty work, after having tricked both Captain America and the FBI agents into believing he had died. When the US forces completed plans for a powerful machine, the Power Drill, the Red Skull robbed them. He took the plans after killing Major Douglas in his own house, using his "Touch of Death". The murder put Captain America and Bucky again on his tail and that same night the Red Skull sent a bunch of thugs to dispose of them but they were easily vanquished. However, his plans proceeded well. Hidden in an old abandoned subway tunnel, while the public became more scared, the Power Drill was built. Sure of its power, the Red Skull was ready to break the country and even make Hitler shake with fear. (Captain America Comics#3/1/Captain America I#112 (fb)) - When the Power Drill was uncovered, it brought utter destruction upon the country. 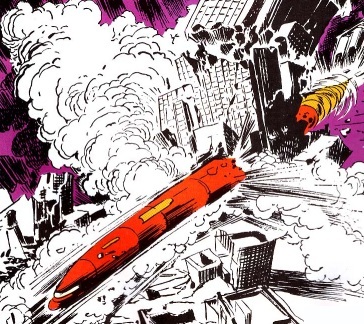 The slithering gigantic drill crushed buildings and houses, sparing nothing in its path of destruction, killing thousands of people, and the Red Skull was behind its controls. It didn't take long for Captain America and Bucky to appear. They jumped on the roof of the drill and they were immediately shot at by the Nazis. Policemen gathered and shot back, protecting the heroes and the Red Skull ordered to retreat. Knowing the threat that the two heroes posed for his plans, the Red Skull attacked them after paying to attend a show of Cap and Bucky held for people, unware these were criminal imposters. One of Cap's henchmen died attacking the Red Skull, and the two heroes were quickly overpowered by Red Skull's underlings. Cap tried to confess that Bucky and he were only imposters in search for easy money. It was true but the Red Skull didn't believe them. They were taken to his hideout under Coney Island and were killed by hanging. Immediately after, the real Cap and Bucky found the hideout, and quickly defeated the henchmen. Bucky hit the Skull, whose "Touch of Death" didn't work on him. Cap and Bucky had guessed how it worked and had their gloves insulated. The Red Skull smashed a chair on Bucky's head and ran to the Power Drill. He launched a bomb at the arriving Captain, who hurled it back to the Power Drill. The following expolosion was huge, the Power Drill was destroyed and the Red Skull nowhere to be seen, believed dead under the debris. Comments: Created by Joe Simon (writer), Jack Kirby (artist), Ed Herron (script). Scripter Ed Herron created the Red Skull, or contributed in some way with Joe Simon. Red Skull killed Major Croy with his "Look of Death". Red Skull stunned Major Croy and erased his memory for months using a special gas. Red Skull killed General Manor and beat his wife Mildred. Red Skull wounded General Curtis and tried to silence his housekeeper with a "sleep gas". Red Skull was an American: George Maxon. 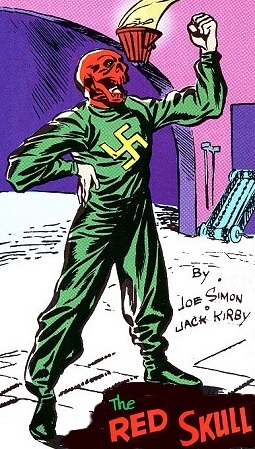 Red Skull was a German agent, a doppelganger of John Maxon. Red Skull (apparently) was killed by his poison and Cap let him die. Red Skull escaped from Cap and Bucky's hands. In the Official Handbook of the Marvel Universe Deluxe Edition Update#6 (1989) it was stated that George Maxon and John Maxon might be the same person. Several times after the Red Skull/Johann Shmidt impersonated important and/or wealthy people. The first ones who come to my mind are Cyrus Fenton and Aleksander Lukin. Important, extensive commentsby John McDonagh about the various Red Skulls are here, read them! Following Red Skull Golden Age appearances did not involve George Maxon. Supposing that John Maxon imposter was a German Nazi agent different than George Maxon, let's compare some features regarding the various Skulls. Considering *only* the Golden Age appearances, George Maxon could also have appeared in Captain America Comics#7 (nope, thats apparently Shmidt)), #61 (apparently Malik's 1st app) and #74 (maybe). 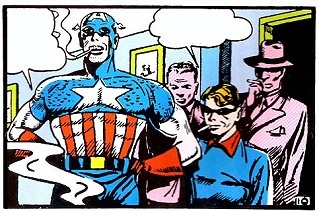 Assuming that John Maxon imposter existed and appeared between CAC#7 and YA#1 (an unidentified imposter), he could also have appeared in Captain America Comics#37 (Shmidt again), #61 and #74. Was it the real Red Skull, the one in YA#1/CAC#16/YA#4 not known by Rogers? It is rather unbelievable that Cap captured the Skull in YA#1 and then did not recognize him in CAC#16. Did Bucky and he never unmask him? Did he actually die? 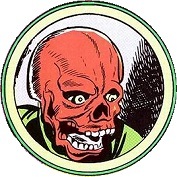 If so, he's also a good (but not the only) option for the Red Skull appearing in Captain America Weird Tales#74. Why? Because the Red Skull fought a Captain America different from Steve Rogers. I assume that the enchantment which transported Captain America to hell worked exactly on the *name* written in the book. So it did not pick Steve Rogers up, who was in suspended animation, but the man who was using Captain America's name in those years. I missed a lot of other issues and OHotMU entries, so if anybody can/want to add/correct anything to this explanation, please do it! The Power Drill was an exceptional excavator! What if it dug through the underground hideout near Detroit for the 5th Sleeper? and has no known connections to any other "Red" or "Skull" character. or any other characted with a similar name. Croy was a normal human. Croy was Major in the US Army. His death could ease Maxon's plans of destabilisation. Major Croy received a message from the Red Skull, announcing his death, but Croy did not believe it. One night after he had been accompanied home by private Steve Rogers, Croy was assaulted by the Red Skull, and strangled. The Red Skull forced him to stare at his horrible mask, succeeding in killing Croy and in leaving a scared stare frozen on his face. Slug was a normal human, he was also a gangster and one of Red Skull's henchmen. Slug was one of the underlings hired by the Red Skull to overthrow the government and make money illegally. During one of the secret meetings, Slug was guarding the alley outside the headquarters when he luckily discovered Bucky. The young hero almost fell from the roof and Slug managed to grab, beat and capture him. Shortly after he and the other henchmen were attacked by Captain America, who easily defeated them. General Manor was a normal human but also a militaristic genius. Manor's death was chosen by the Red Skull because the General was a militaristic genius, so his death would be a great loss to the USA. 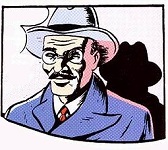 Manor was approached by the Red Skull in his civilian identity of George Maxon. While the two attended the test of a new airplane, a death message arrived at Manor's house. That same night Manor received the package from his wife Mildred and shortly after having read the message was killed by the Red Skull. Mildred, smartly took a gun and ran to her husband, but was so scared at seeing him dead that she dropped the gun. She was terrorized by Red Skull's gaze but he only punched her, because he only needed to kill important people. Major Douglas was a normal human. Douglas was an important member of a military conference. The conference had worked out the plans of a Power Drill and Douglas protected them. Unfortunately for him, despite his courage and his fighting wits, he was cheated by Red Skull's "Touch of Death". Every blow Douglas gave to the Skull produced a deadly electric charge that eventually killed Douglas. His dead body was found by Steve Rogers and James Barnes. The imposters were actaully Duffer and Midge, two thugs among a crime boss' henchmen. The boss' idea was to earn money using Cap and Bucky's fame. Duffer and Midge wore costumes remiscient of the two heroes and the other criminals set up a show at Coney Island: Whoever desired to see the heroes in person had to pay 10 cents! Their game didn't last very long because among the several people gathered for the meeting were also Steve Rogers and James Barnes. The two soldiers beat the phony heroes and the crowd realized that they were imposters. Later the Red Skull also attended, not knowing that Duffer and Midge were imposters. The two were overpowered and taken to Skull's hideout under Coney Island. There the Red Skull had them killed by hanging. The Power Drill was a weapon of mass destruction. Designed by the US Army and built by the Red Skull, it was a very innovative and dangerous weapon. The machine looked like a giant red worm with a drill as its head. Its more than 14 feet diameter and around 300 feet length made it a huge, destructive, metallic snake. It could run underground, through soil and rock, and on surface it could easily run through buildings, smashing them like sand castles. It had a driving cabin and several firing turrets. They could pop up from its back where a man could fire a machine gun. Although the Drill could bash through solid rock and sustain the fall of hundreds of tons of cement, it was hardly resistant against bombs. The one used by the Red Skull destroyed it with one explosion. In its first and only mission, the Power Drill destroyed several buildings, killing thousands of people.